I’m always amazed at how much some people invest in Valentine’s Day, whether financial or emotional; while others prefer to spread the love and attention out throughout the year. Whichever type of person you are, why not give a home-baked gift this year? Personally, I’m not phased if this day comes and goes because I think it’s become very commercial, but what I do enjoy, is listening to other people’s love stories that this Day of Love makes them reminisce about. The other day on talk-back radio they had callers sharing their biggest regrets, and some were pretty random, but one man recounted that he had been married to his sweetheart for 55 years. He described it as “seeing an angel on the side of the road and being determined to find out who she was”. He managed to find her and has been in love with her ever since. His only regret was that he met her when he was in his forties instead of his twenties so he could have had more time with her. Awwww! Melts my heart! The kind of love I enjoy throughout the year is the little things. When I leave work to do the school pick-up, I’m on a pretty tight schedule. Minutes count as I have a fair distance to cover to get to the school on time. I had a particularly busy week this past week and one afternoon as I was rushing out the door, I received a text message. Always inquisitive, I checked it as I got into the car, albeit a little harassed that whoever it was should know what a hurry I was in, only to see that it was from my husband, taking a few minutes out of his day to remember that I would be leaving work and on my way to the school. His message read “Be safe and don’t rush too much”. Love is patient, love is kind. It does not envy, it does not boast, it is not proud. It does not dishonor others, it is not self-seeking, it is not easily angered. It keeps no record of wrongs. Love does not delight in evil but rejoices with the truth. It always protects, always trusts, always hopes, always perseveres. Happy Valentine’s Day from me to you. I hope you share it with your loved ones; partners, parents, children, extended family and wonderful friends included. Bake the cookies as per the recipe in the link above, using a heart shaped cookie cutter and allow to cool. 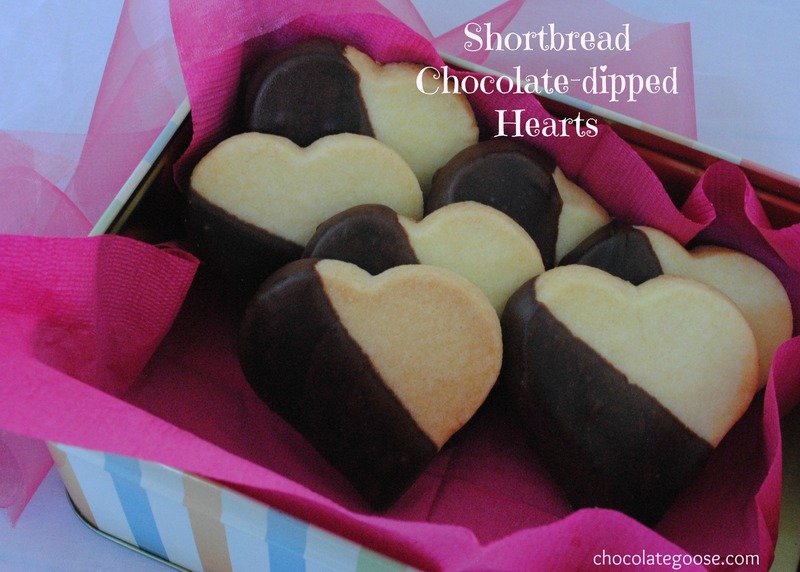 Dip the cookies into the ganache and set aside on a cake rack over baking paper to set (or you can leave out the rack and put them straight onto the baking paper, but the chocolate sometimes pools and then doesn’t follow the shape of the heart). Allow to set before packaging them for your favourite person (or perhaps even just for yourself!). Heat the cream in a saucepan on a medium heat until small bubbles form around the edge, but do not let it boil. Remove from the heat and add the chocolate. Stir gently to combine.